Excellent opportunity! 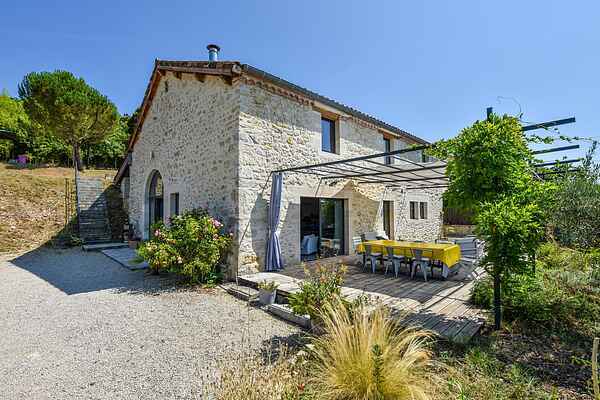 This modern house in the lot is only 3 km from the Lot River winding through the landscape, which in Caix / Luzech (8 km) widened and where you can go swimming, sailing, pedal boating and canoeing (rentals and has a indoor heated swimming pool that is so delicious laps before exploring the region Whether you swim in the lake from the fun Catus (7km), with also hire surfboards and pedal The beautiful Cahors is 10 km:.. admire there is the old town and the famous Pont Valentré, the oldest Gothic fortified bridge in Europe. Cahors is also famous for its wine, which you can taste a stone's throw from one of the numerous castles. Within a half hour drive from your holiday home you will find medieval towns like St. Cirq Lapopie and Puy-l 'Eveque in the Lot, Gourdon, Villefranche-du-Périgord Domme and the Dordogne valley. The famous Rocamadour is a little further (55 km) but the trip worthwhile.